On April 18, Volga-Dnepr Group and Sheremetyevo International Airport signed a long-term agreement to develop an international standard cargo hub at Sheremetyevo. Within the project framework, Sheremetyevo will build a new cargo processing complex with 40,000 square meters of space. 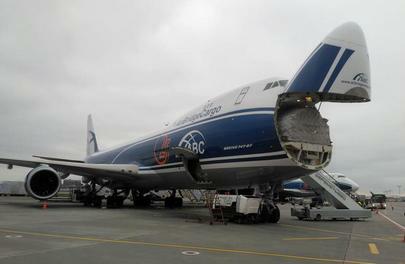 Volga-Dnepr, in turn, will increase its volumes to fit the new capacity. The first stage, with an annual capacity of 380,000 tons of cargo, is expected to become operational by May 2017. The construction will require a 45 million dollar investment. The terminal will feature a “module structure”, which allows for the capacity to be raised to 1 million tons per year. The investment required to build the terminal is provisioned in the airport’s development program. According to Sheremetyevo’s press-office, the terminal will combine an automated process and innovative solutions with the capability to adapt to carriers’ fleets, cargo structure, peak loads and future regulations. Although the new terminal is primarily designed for Volga-Dnepr’s cargo flows, other carriers will also be able to use the premises, Sheremetyevo’s general director Mikhail Vasilenko told Russian Aviation Insider. The Volga-Dnepr Group has committed to increase its cargo volumes to 430,000 tons per year by 2020. Sergey Lazarev, head of the Group’s subsidiary AirBridgeCargo, which specializes in regular cargo flights, claimed that at the end of 2016 his airline will have carried 330,000 tons of cargo through Sheremetyevo. To cater to the projected growth the airline plans to expand and renew its fleet of eight Boeing 747-8Fs and seven Boeing 747-400s. By 2025, the airline plans to phase out the 747-400s, and bring the number of 747-8Fs to 25 aircraft. The delivery schedule stretches for 10 years with 1.5 to 2 new aircraft to enter fleet every year. Construction of a modern hangar complex for maintenance of Volga-Dnepr’s aircraft is one of the crucial aspects of the new hub model. It is safe to assume that the maintenance facility was a key factor in the agreement. In 2013, when Volga-Dnepr opened its own maintenance hangar in Leipzig/Halle Airport, the group’s president Alexey Isaikin stated that it was easier to build one in Germany than in Russia.